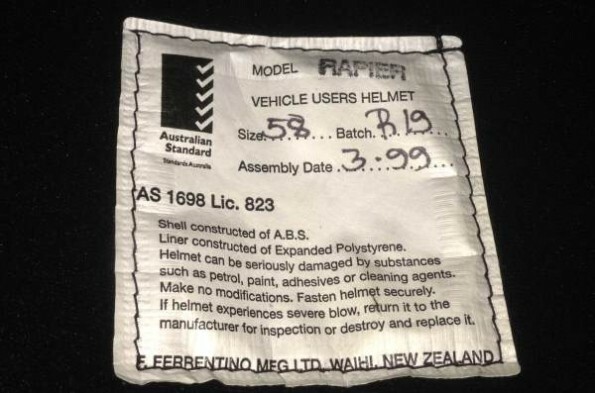 New Zealand has very little manufacturing of helmets and therefore uses a mixture of international standards from Australia, the EU, Japan and the USA. The standards are to ensure consistency in head protection. A helmet can have a wide variety of different designs and types (see them all here). A helmet will have a sticker on it showing which standard it adheres, too. 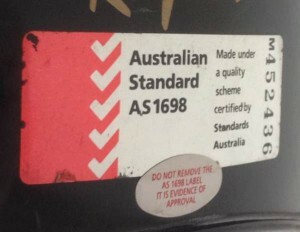 For example, this helmet shows Australian Standard AS1698. Helmets should only be cleaned with soap and water, and should be destroyed and replaced if they are involved in an accident. We can see in the following image that the model is a Rapier, the size is 58, the batch is B19, the manufacture date is March 1999, and it’s made by F Ferrentino Mfg Ltd in Waihi. There are also construction details, instructions for cleaning and a reminder to destroy or return the helmet if it’s been involved in an accident. The local laws for each country that produces the standard will outline penalties applicable for not conforming to it. For example, in Australia there are fines of up to $220,000 for an individual and $1.1m for a body corporate for failure to comply with a mandatory safety standard. In Australia it is recommended that any helmet bought before the standard was put in place on 19 December 1990 is replaced with a more modern one.